Bob and Josh work A LOT at I Like To Make Stuff. 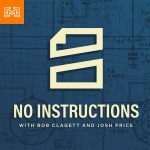 The No Instructions podcast is a dedicated time for them to play with toys, build Lego sets and chat about life, kids and nerd culture. And of course, the show can often go in really random directions, because there are literally, No Instructions. So, put away your work, grab your favorite model kit, and have some designated play time. The guys are discussing how to be sad. That may sound strange, but men, Josh admittedly, doesn't know how to process being upset. They hope that this candid discussion is helpful to you in your time of need. The whole ILTMS crew; Bob, Josh, Forby, & Anthony are here this week talking about their team dynamic and how each person's strength comes together to run I Like to Make Stuff. Also, go watch Birdemic...it's terrible. Bob is back from WorkBenchCon 2019 in Atlanta and Josh went on a voyage to IKEA. Listen in as the two Makers discuss their feelings about the Swedish furniture megastore! Bob has always wanted a tattoo and Josh has a few, so the guys are discussing getting/having/living with body art. 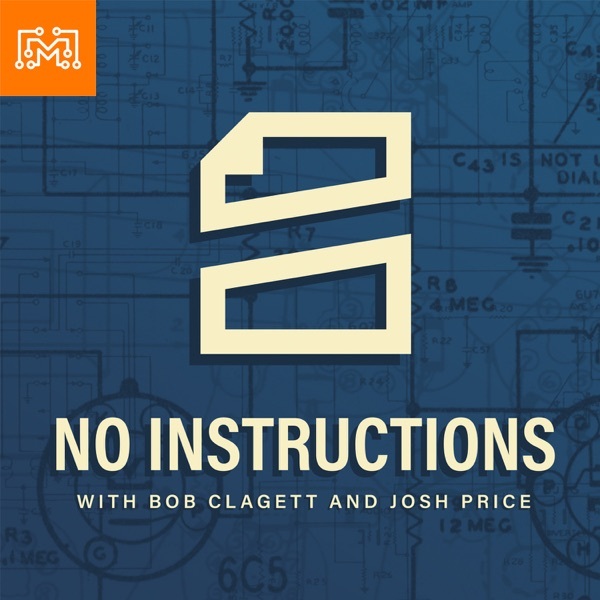 As Bob prepares to go to WorkbenchCon, the guys reminisce about their random celebrity encounters; like watching movies with J-Lo, getting groped by Gary Sinise, or being handcuffed in the Oval Office. The guys discuss Valentine's Day, their stance on greeting cards, and more obscure movies that Josh hasn't seen. Also, Josh's son shows him how to set parental controls on the Switch in hopes of playing Fortnite. The guys are back from their massive project and are talking about abusive but helpful YouTube comments. They are also talking about Fortnite and how to approach it as a parent of young kids. The guys are talking about their Christmas and New Years. It's been a minute since they've recorded and we're getting all caught up. The guys made up a movie on the spot during a conversation about Ice Pirates, an obscure 80s movie. They do a bunch of Pro & Cons, and wish you all a Merry Christmas and Happy Holidays! Bob is heavily conflicted about a recent impulse buy and Josh surprised his son with a new dragon! Bob & Josh talk about some behind the scenes antics and the mechanics of running I Like to Make Stuff. Bob is still trying to convince Josh that Solo is a good movie, and Josh doesn't like bar soap. Bob & Josh are discussing friendships and how they maintain those relationships through adulthood. They also recap their recent half marathon and their upcoming race in December. Bob, Josh, and Wes from Geeksmithing, went to go see First Man, the Neil Armstrong biopic. They discussed rocket clubs and all the other extra-circular activities they were involved in as kids. Find out why Josh went on a cursing rant on public access TV during an academic team match. With Hurricane Michael barring down on Josh's hometown, the guys discuss their experiences with hurricanes and random tornadoes while living in the south. Find out why Bob spent his prom night under a table in a bowling alley. The guys are talking modern treasure hunting, the new Mandalorian show, Die Hard, and some Fun Pros/Cons about Dancing. The guys discuss their latest trip to California and get deep into their thoughts on family heirlooms and leaving lasting memories for their families. Bob doesn't remember Top Gun so Josh fills him in with some personal stories about how he has the need for speed. Then they discuss nostalgia and how it affects our present and how people try to use it to shape their futures. The guys are talking about getting healthier and how Bob signed Josh up for a half-marathon. The guys discuss the agony of being patient, Star Wars comic books, pogs, breaking models, and going to space. The guys discuss why they are bad at vacationing. The guys explain how Lego shaped their childhood, the Star Wars prequels, and European vacations. The guys talk about the new podcast and how Josh hasn't seen good movies.